Novak will try and fend off the charging Llodra. Novak Djokovic received the booby-trapped gift of Del Potro in a similar round at RG and now Nadal has tall task of finding away to stop the consistently Argentine at Wimbledon. The Spaniard did take the DelPo down Indian Wells, but that was less than three months into Del Potro’s comeback and he looked pretty good in overcoming a motivated Gilles Simon 7-6(8) 7-6(5) 7-5. Del Potro is still not that comfortable on grass though and Nadal is. So much will depend on how well both men serve and whether Nadal can find away into Delpo’s backhand side. He absolutely must not allow Del Potro to climb into the zone on his forehand side. Nadal will scrape through in five dramatic sets. As I wrote on USTA.com, this is winnable match for Fish, but 2010 finalist Berdych is playing extremely well again and will have to be knocked out of his comfort zone. The two have never played before and both are serving like monsters. Fish is a better volleyer and can match the Czech from the backhand side, but Berdych has a harder and more accurate forehand. If Mardy is going to reach his third Slam quarter, he must do an excellent job of attacking Berdych’s second serves, which I think he will and pull out a four set victory. How exactly is Gasquet going to win this match knowing that Murray has come back from two sets down against him twice, including at 2008 Wimby, when Gasquet served foe the match at 5-4 in the third set? Sure he has tremendous talent, but the in-between-the-legs shot master Murray is right there with him, is mentally tougher and is a more solid all around player. The Frenchman will win one set, no more. Huge props to both guys for getting here: to Lopez for his first-ever victory over Andy Roddick in the last round and to the Pole for qualifying and upsetting Gael Monfils. Kubot can really play, but with the way that F-Lo is serving, volleying and passing, he’ll get through here in straight sets. This match will be a blast to watch, even though you have to like the Frenchman to come though on grass based on his big serve, athleticism and ability to take over the net. But Ferrer is a speed demon who has actually been volleying quite well himself. Whether he can stretch this to five sets will depend on his return, but let’s assume he will return at least decently, because you know the guy thinks he can mentally outlast the Frenchman. Ferrer may be able to for two sets, but Tsonga has become a better competitor late in matches and he believes he can win this one, which is more than half the battle with Big Jo. Tsonga in five. The all-time great is 10-0 against the Russian, has beaten him twice on grass in Halle and has only dropped 2 of 24 sets to him. Is it clear enough who is going to win this match? Federer will enter the quarters again virtually untouched and then the fun really begins. Few expected this fourth round contest, but Tomic is developing into a fine all-around player and the aging Belgian has gone deep twice at Wimbledon, so it should not come as too much of shock. The 18 year old has a lot of variety, as he’s able to keeps his slices low and can hammer his forehand. Malisse beat him on grass in Queens last year, but Bernie appears to be growing up mentally and will stay composed long enough to win in four. It finally looks like Australia has another top-10 player to be on its hands. Llodra joins Lopez as another lefty serve-and-volleyer in the round of 16 and the world has seen him stifle plenty of foes, but even though Djokovic was feeling awful in his four-set win over Marcos Baghdatis, he still returns better than anyone else on tour and serves big enough to keep the Frenchman from chipping and charging a ton. This one will be a mini-thriller, as Llodra won there only super fast court meeting at the 2010 Paris Indoors. Djokovic won their other two meetings on slower outdoor hard courts, but with the weather heating up, the grass court should play significantly faster. 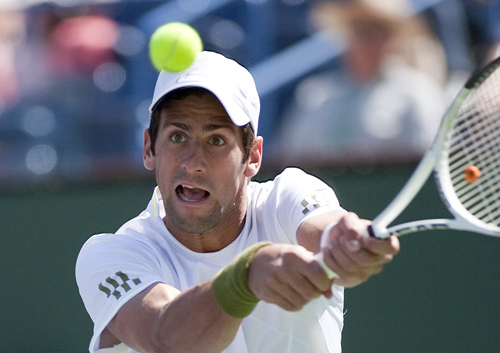 I see Llodra making charge, but believe that Djokovic will win almost all the big points in a four set victory.